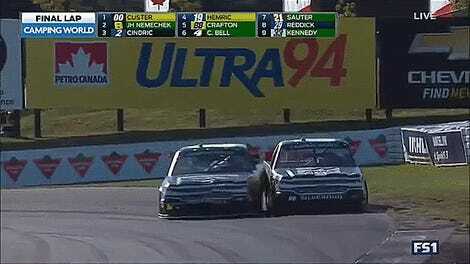 Another year of NASCAR Camping World Trucks at Mosport, another hit-to-win ending. This year was at least less dramatic than last year’s shove into the wall followed by a fistfight, but it was still a totally classless bump and run by a driver who quite frankly should know better. No. 19 Brad Keselowski Racing Ford driver Austin Cindric, the privileged child of Team Penske president Tim Cindric and a guy who should certainly know better, straight up punted Kaz Grala’s No. 33 GMS Racing Chevrolet into a spin to steal the lead. Cindric, whose team is owned by and named for a Team Penske Cup Series driver, has had all kinds of opportunities to drive nearly anything he wants, from open-wheel U.S. F2000 cars to Global Rallycross cars and Pirelli World Challenge sports cars. In other words, he may be young, but it’s not for lack of experience that he made the bump. I gotta acknowledge what I did to Kaz in turn 5. Everyone’s watched this race [in] many years past—everyone knows it’s going to come to contact if the second guy is close to the first. I raced with Kaz growing up, he drove my [Bandolero] as the first car he ever drove. I know his family, so I know they’re not going to be overly excited about it, but he already had a win, so I didn’t feel too bad about having to do something to make it happen for this team. Besides, he argues, they were childhood buds! Man, something tells me that friendship is strained after Cindric couldn’t make a real pass happen. Cindric’s current Brad Keselowski Racing team will also shut down after this year, so I have no doubt that Cindric feels the need to perform. Thing is, if you’re the son of Team Penske’s president, I don’t think you even have to be this thirsty to land somewhere else next year. Someone will find your well-connected fam a place for you. Cindric had already made an impressive show for himself earlier in this race, scoring pole position and then driving back to second place after getting a stop-and-go penalty for a pit stop mishap that put him near the back of the field. But alas, the added stress of NASCAR’s playoffs have a bad habit of forcing drama to happen. That was a dump and run. 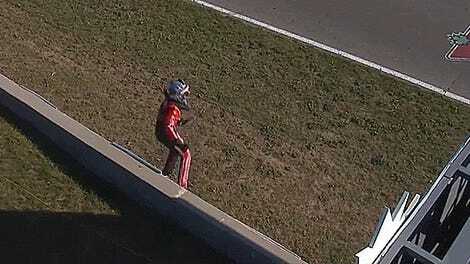 To be honest, I know he’s racing for a playoff spot, and I get that, but he didn’t try to pass us, even. He got to us and ran us over. Last year, you can say what you want about the finish but you know what? They finished 1-2, and they were both going in the right direction. I mean, don’t think [Cindric] even braked for Turn 5. So, honestly, I know he’s a great road course racer, and I had a lot of respect for that, but I lost some right there because I wouldn’t race someone like that. I’d move them out of the way, especially with as much on the line as he had, but that was too dirty of a move. I can’t get behind that at all. 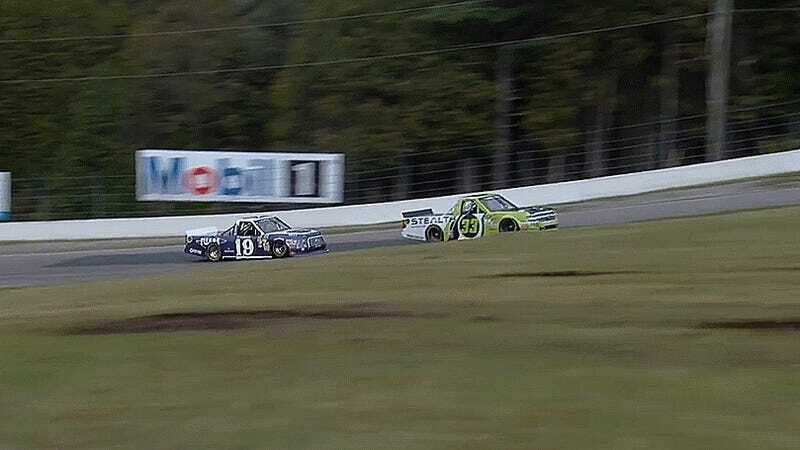 If there’s an upside to pulling a dirty move, it’s that both drivers are now in the Truck Series’ playoffs, and Grala’s not going to be as nice to Cindric from here on out. NAS-karma is a thing!